The harmonic scalpel uses ultrasonic technology that allows both cutting and coagulation at the precise point on impact, resulting in minimal lateral thermal damage. It was introduced commercially in 1993 and it is being used by thousands of surgeons worldwide for open surgery and laparoscopic surgery. The harmonic scalpel has five power levels. Increasing the power increases the cutting speed and decreases coagulation. In contrast less power decreases cutting speed and increases coagulation. The ultrasonic vibration of 55,500 Hz remains the same at all power levels. At level 1 the blade excursion is approximate 30 microns where as in level 5 it is 100 microns. Vibrating at 55,500 times per second, the HARMONIC blade denatures protein in the tissue to form a sticky coagulum. Pressure exerted on tissue with the blade surface collapses blood vessels and allows the coagulum to form a haemostatic seal. The surgeon controls cutting and coagulation by adjusting the power level, blade edge, tissue tension and blade pressure. By using only mechanical longitudinal vibration at the distal end, no electrical current is passed to or through the patient, and damage to surrounding tissue and nerves is minimized. 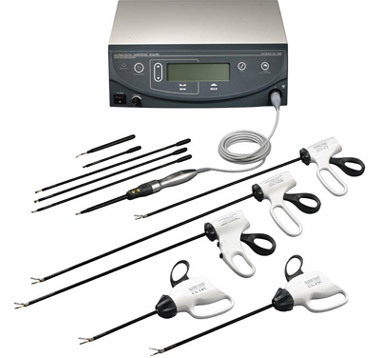 The only disadvantage is the high cost because of the high cost of the generator and hand piece as well as the high cost of the disposable probe that enters the patients abdomen. A combination of the Ligasure and the Harmonic Ultracision is the best technology available today for performing advanced laparoscopic surgeries like hysterectomies and myomectomies. Harmonic Ultracision is a product of Ethicon Endosurgery, a subsidiary company of Johnson & Johnson Pvt Ltd.